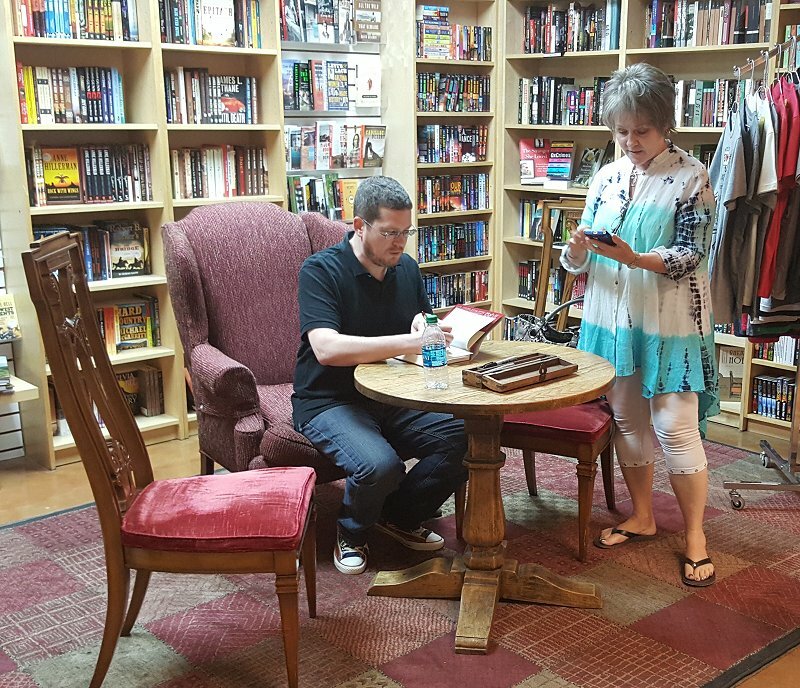 Alex Grecian at The Poisoned Pen! Finally! An event at The Poisoned Pen that Denis could attend with me! 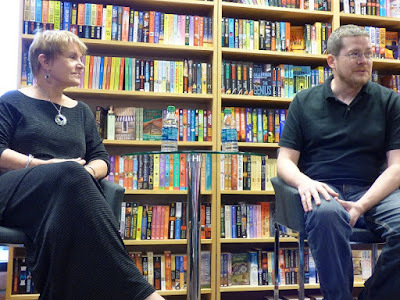 This would be the third time we've seen Alex Grecian, author of the Murder Squad mysteries that we both enjoy, and we were looking forward to it. In fact it hadn't been long since I'd read his latest book, The Harvest Man, and put it on my Best Reads of 2015 list, so I was really looking forward to seeing him. Barbara went on to report that the store would also host debut novelist Anne A. Wilson, whose book Hover is about a female helicopter pilot who flies training exercises with Navy SEAL teams. 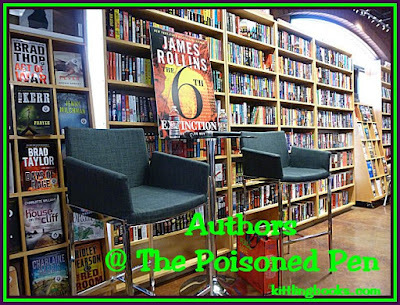 At the end of June, Shona Patel-- author of the #2 bestselling trade paperback at The Poisoned Pen, Teatime for the Firefly-- would be there to talk about her latest book, Flame Tree Road. And guess what? Both these authors live in nearby Fountain Hills! When Alex Grecian took his seat, I had to take a look at a ten-year-old boy who was attending with his father. The boy was wired-- so excited to be there with his dad (who was a diehard Grecian fan), and so pumped to have a chance to see a real, live author. When the two had arrived, the boy was quick to ask how he could reserve seats because he wanted the best ones in the house. He'd made me smile, and-- sure enough-- when I looked over at him, he had a huge grin on his face, and I could swear he was floating an inch or two above his seat. I love young readers! Barbara then asked him about the historical characters in The Yard. 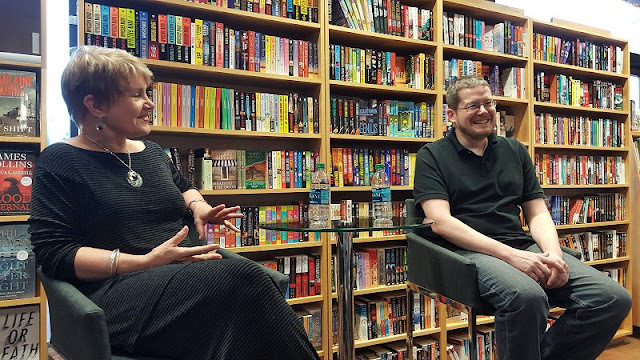 "Yes, I had a few," Alex said, "but when I learned that the book was now going to be a series, I had to do some things differently. I changed everything but the procedures, and now Commissioner Sir Edward Bradford is the only historical character." Before going on to talk about The Harvest Man, Alex asked how many of us had read the book. Only Barbara and I had. Alex smiled at me and did a little half wave. "I got these shoes for you!" More on the shoes later, but suffice it to say he'd remembered my two-thumbs-up review of his shoes the first time we met in 2013. After Peters mentioning that it had been "Ripper Week" at The Pen with other authors also having written about the most infamous serial killer of them all, she returned to the subject of Claire Day. "After some of the comments you've made, I have to ask if some aspects of your own marriage get written into your books?" "Yes, there are definitely elements of my own marriage in my books!" Alex said. 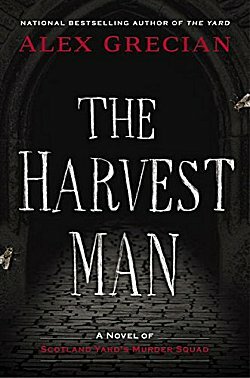 The Harvest Man is the second Murder Squad book (after The Devil's Workshop) in which Jack the Ripper appears. Talk naturally had to gravitate toward Saucy Jack for a minute. "Jack the Ripper is the world's first celebrity killer, and he opened the floodgate for people to do bad things in order to get attention," Grecian said. "He should not be celebrated. He's nothing more than a garden variety brutal psychopathic killer. I wish he had been fiction. I might be writing My Little Pony or something instead." "I never imagined there'd be a sequel to The Yard," Grecian told us. "That book was written as a fully formed standalone. I had to deconstruct it in order to write it as a series. 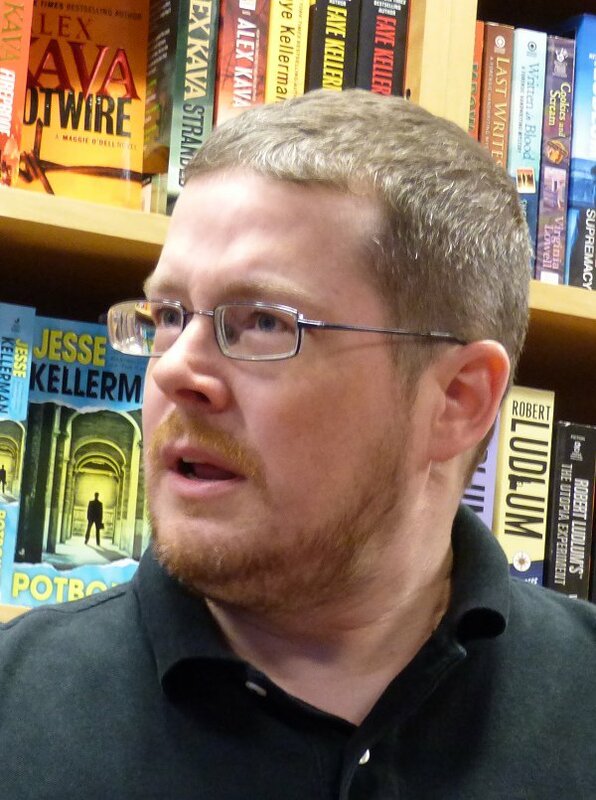 "My next Murder Squad book is called Lost and Gone Forever..."
"That's a horrible title!" Barbara objected, and I agreed in a way. It certainly makes me wonder who's going to be lost and gone! "As I've mentioned, The Yard was written as a standalone. When I was asked to write a series using these characters, I had to deconstruct the book into its separate parts in order to reconstruct it as a series. The second book took Day and Hammersmith out of London. The third book split the two up. This fourth book has them adjusting to serious changes in both their lives." When Barbara asked him how many books would be in the series, Grecian replied, "The sixth book could be the last." "Is there anything else in the works for you?" Barbara asked. Going back to The Harvest Man, Peters mentioned that the focus of the book wasn't really on Jack the Ripper. "No, it's not," Alex said. "The focus is on a new killer who's been dubbed 'the Harvest Man' because he likes to hide in attics waiting for his victims to go to bed. If any of you remember The Devil's Workshop, the Harvest Man is one of the prisoners who wasn't captured when there was that prison break." 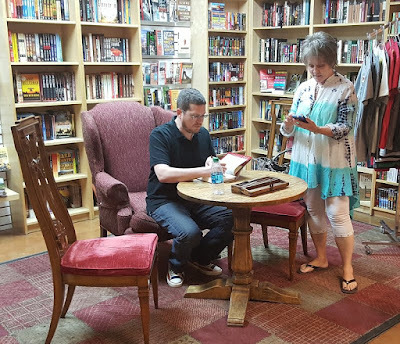 Alex Grecian signing his book for a fan. A fan asked him about the research that he does for his books. Grecian replied, "My Victorian research is pretty much on autopilot now. With my last two books, my primary research was on serial killers. "I do try not to have women and children be victims in these books, although married couples are the Harvest Man's victims in this latest one. "One thing that surprised me in my research is discovering that there's not a lot of information about Scotland Yard," Grecian continued. "There are no photographs or architectural plans of the inside of the building. There are no illustrations showing what their uniforms looked like. It's frustrating, but it does allow me to make stuff up." The ten-year-old fan had a question: "Will they be making a movie based on your books?" Alex smiled and said, "There was an option taken on The Yard, but it was shelved when 'Ripper Street' was broadcast. That option was on a single book, not the entire series though." It was then that Grecian told us that he was thinking of writing a "spec script" for CSI before he wrote The Yard. Another fan mentioned how much he liked the character of Dr. Kingsley. It was obvious that he's a favorite of Grecian's, too. Kingsley is based on British pathologist Sir Bernard Spilsbury, who "had a sense of smell like Wolverine's and was Sherlock Holmes for real. Spilsbury committed suicide, which is why I changed the character to Kingsley." One of the surprises I had when I started reading The Harvest Man was the inclusion of poetry from Robert Louis Stevenson's A Child's Garden Of Verses. When I was eight and read those poems, I learned how wonderful poetry could be. They still rank high in my memory, but in Grecian's talented hands, those verses took on a decidedly sinister cast. I asked him about it. Lost and Gone Forever takes place one year after the events of The Harvest Man. Alex's wife pays close attention to what's happening, and she wants Nevil Hammersmith and Fiona Kingsley to get together. 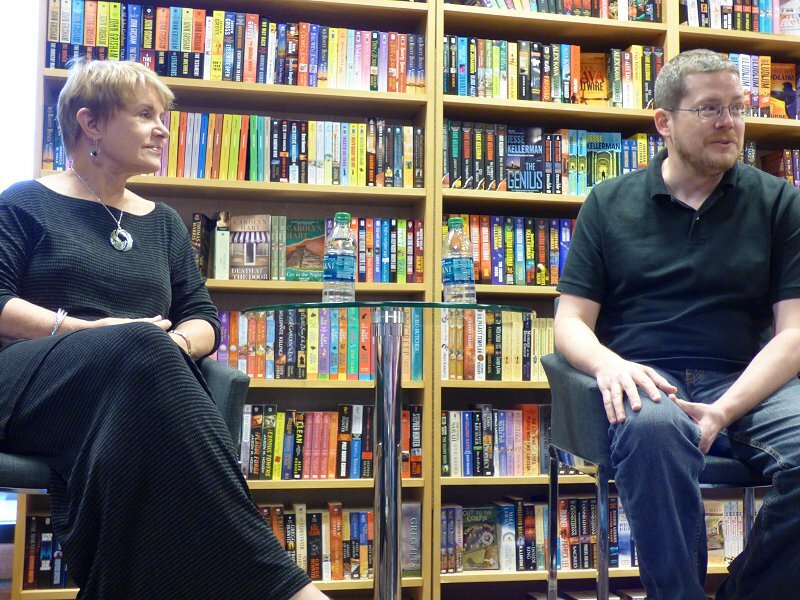 "The problem is, Fiona's too young, so I had to have a jump in time in the new book for my wife," Grecian said. When asked about violence in his books, Grecian commented, "I abhor violence. I don't want to glorify it, but I don't want to sweep it under the rug either. You know, it's the strangest thing, being a writer. When my wife sees me and I'm in a really good mood, she knows I've killed someone that morning!" That's it, Alex-- end the evening with a laugh! Once again time had flown by. Denis helped out by taking a woman's phone and photographing her standing next to Alex, and then Denis and I chatted with the author as he signed my book. "I was serious, you know," Alex told me. "I wore these shoes just for you!" And he obligingly modeled one so Denis could take a photo. It's going to be a very long wait for Lost and Gone Forever... and a look at Alex Grecian's newest footwear! Ah, another wonderful evening at the PP! 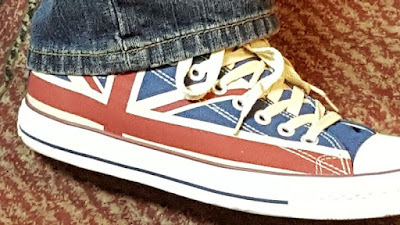 I absolutely love those shoes, too :-) Thanks for sharing, as ever, Cathy.